We were caught twice on lineouts, James Lowe took a risk too many at times, and with the reigning champions Saracens being our 'reward' for six wins out of six in a Pool of Death, it's abundantly clear that nothing has been won yet. Right, that's it. Barely fifty words into my writeup, and I'm done with the negatives. 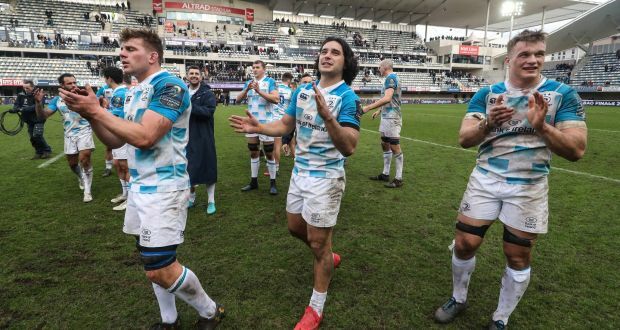 I could probably stretch the above points into a load of paragraphs to make for a longer read, but if I did then I feel I'd be doing not only Saturday's Leinster performance, but also those throughout the pool phase which earned us top-seed status, a gross disservice. I mean seriously - how can you find more fault with this display? Away to the leaders of the Top 14 - who had pretty much their strongest lineup on the park and needed a bonus point win to have a hope of advancing - we came away with a four-zero split in match points and we weren't a million miles away from maximum. For me the difference between the two sides was simple. Montpellier players did some good things, like when Benjamin Fall outjumped Rob Kearney for a high ball or Konstantin Mikautadze swimming through a maul to rip the ball off of Jamison Gibson-Park, only for the work to be quickly undone by bad things, like Fall knocking it on in the next tackle or Mikautadze pinged for not rolling away minutes later. They had clearly identified two areas where they could hurt Leinster, and they were ones that others have noticed this season as well - one was to ship it extremely quickly into the wide channels to get excellent front foot ball. Also if you get a penalty around half way, with a well-organised maul plus a few alternatives, you can keep our defence guessing and score tries more often than not from 5m out. Meanwhile on our side we were pretty much doing the exact opposite. Two second quarter tries from our hosts, both from lineouts in the same corner of the pitch, would have demoralised many teams in this competition - but whatever magic dust the coaching staff sprinkled around the dressing room at halftime had us not only attacking more effectively but it also cancelled out the French resistance with two tries of our own, also from lineouts. All this was after an excellent start from Leinster when a shallow enough kick from inside the Montpellier 22 fell to Ross Byrne who ran it back and gave it to James Lowe who, after a neat exchange with Gibson-Park, got it all the way to the line and somehow managed to avoid knocking on before his scrum-half was able to chuck it out to Byrne to round off an almost perfectly symmetrical sequence. His conversion went wide but it wasn't long before we were stretching our lead to eight points with a penalty at the end of the first quarter, and all of this was accompanied as usual by scorching line speed, getting in Montpellier faces to such an extent that even when the likes of Nadolo, Nagusa and Fall found some space, there was enough of a scramble to clean things up. We even managed to thwart the third French attempt to hurt us with lineout and maul, [though perhaps Luke McGrath was a bit fortunate not to get further sanction for collapsing] with Devin Toner rising high to pluck the next one out of the sky for us to escape. Just to be clear, I'm not trying to suggest we didn't make more mistakes than I've outlined. My point is that our prevailing attitude, particularly in the early stages of each half, meant that we played like we always knew there was another score nestled in our back pocket, and if that kind of confidence could be bottled there isn't a cryptocurrency in existence that would earn you a bigger fortune. Sean Cronin got man of the match, and I certainly wouldn't begrudge him such an award but I'd have been more inclined to give it to Robbie Henshaw for leading the tackling charts and finishing his try extremely well, on top of all the other extras he throws into his game at no extra charge. And I thought Gibson-Park showed exactly how beneficial he can be, especially in the 'red zone' where he can find the right type of pass to unlock a stubborn defensive line. But again, this really wasn't about individual performances - it was the team effort that stood out, from 1 to 23, and this has been a feature of pretty much all six of our matches in this pool. Of course we made mistakes and of course we were met with challenges...but I've said it many times before and I'll say it again - we were in a pool with the teams with the best records in ALL THREE top domestic European competitions. So what is our reward for this great 100% achievement? We only have to go and play the two-time defending champions, that's all. But for all of the caution we will need preparing for that mammoth clash in the Aviva Stadium, we'd be mad not to believe we can do it. In fact, there are plenty of challenges for Leinster in the meantime - like the usual block of matches during the Six Nations which include two top-of-the-table Conference B deciders with the Scarlets.